Campers will have so much fun they won’t know they are learning! Campers at our ropes course will learn valuable skills such as communication, leadership, and team building and so much more. 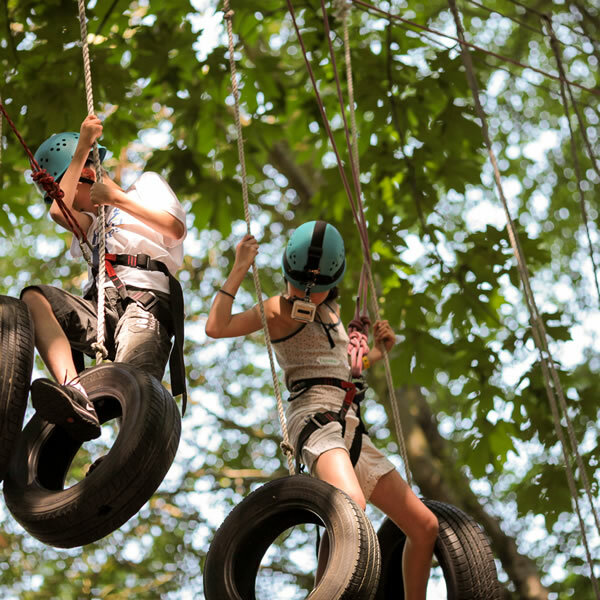 We provide a series of FUN interactive activities and games everyday in our ropes course forest. There will be 1-2 high rope activities per day. Campers will begin the week with a series of activities on the ground designed to build trust and teamwork, before progressing to the exciting and challenging high activities for the rest of the week. We operate on a “challenge by choice” policy and welcome all ability levels. High activities vary, but typically include the Giant’s Ladder, Swinging Steps, Giant Swing and Zipline! Please visit our website www.palropescourse.com to view the UBC camps Ropes Course video to give you an idea of the fun week we have planned. Visit the www.palropescourse.com website if you need to download the 2 required forms (these forms are separate from the UBC forms). Our main entrance is via the Thunderbird Stadium parking lot. We look forward to an exciting summer camp week with your child at the Ropes Course! No Limits gives you the opportunity to take part in an assortment of fun and engaging activities across the lower mainland. With off-campus activities like Splashdown waterslides, Lazer Tag, Second Beach Pool, Jericho beach, UBC Aquatic Centre, and bowling this camp is sure to keep your adrenaline pumping.